As of 2018 Cold Fusion has moved to a rotating troupe membership based on the project being worked on. Terri Massa aka Zara Noor aka Buckshot. Troupe Director. Background: over 30 years belly dancing including studies with Rabiah Banu, Morocco, Susanna DelVecchio, Aziza, Margo, Hadia, Fahtiem, Eva Cernik, Moria Chappell, Farima Berenji and Deb Rubin. She has attended a number of festivals around the country from Wiggles of the West to Suzanna DelVecchio's annual dance retreat in Colorado. Terri has also raised sled dogs and loves animals so much she works with them on a daily basis at a vet clinic. Brighton Brooks aka Time Mime. Troupe Co-Director. Background: Brighton started learning Tribal Fusion style in 2009 followed shortly by American Tribal Style and then ALL THE DANCE. She has since studied across the country and around the world with innovators from many genres of dance including Turkish Romani, hip hop, Persian, Flamenco, and modern dance. 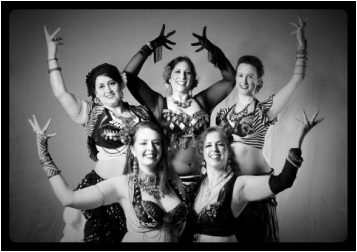 Brighton currently teaches an improv/modern belly dance class through UAF.